Not much changes yet everything seems different whenever I return to my home country of Kenya. I was reminded of my first time in Kisumu last year with Dr. Megan Huchko & Katelyn Bryant-Comstock and how anxious I was, even though I was in Kenya, I was completely unfamiliar with this region, the local language, and the culture. Last year, I was a rising junior filled with high hopes, yet naïve of the intricacies of proposing a project and carrying it out. This year, I have returned with much more practical expectations as well as a greater capacity to carry out my project: using GIS spatial mapping to enumerate the risk of loss-to-follow up for treatment of HPV. My project is taking place in Migori, Kenya as a part of the ongoing Cervical Cancer Screening & Prevention Study. The use of geographic information systems will help us create correlations between women’s sociodemographic variables as risk-factors and treatment loss-to-follow up rates. My hypothesis is women who are located farther away from health facilities will be at a greater risk for loss-to-follow up. Before women can begin to think about treatment, they first must screen. 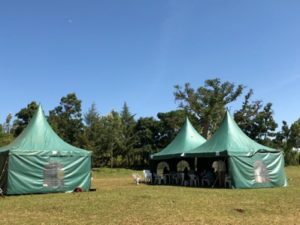 I spent my first week in Migori at the community health campaigns (CHC) where women are screened for HPV and knew I had to write about my impressions of it. We arrived at 9am to Sango village in the community, Osingo. The tents were already set up at the CHC when we arrived. Almost immediately the community health volunteers (CHVs) left to go into the surrounding villages to mobilize women to come to the CHC and within minutes, we received the first flow of women. Early in the morning, the flow was gradual. As we were driving into the CHC location, many of the women could be seen leaving the village with bananas and other fruits and vegetables to sell for the day in Migori Town. 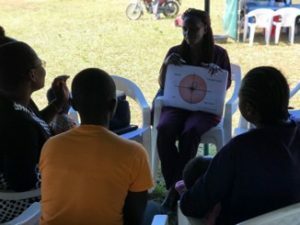 Around noon, there was much greater flow of women coming in to screen which was largely attributed to people coming back home for lunch and being informed of the CHC either by other women who have already screened or the mobilizers. Once women arrive at the CHC, the average wait time is about two minutes before they are registered. At the registration table, women give their names and it is determined whether they have been previously enumerated or not. Enumeration entails capturing the sociodemographic information as well as the GPS coordinates associated with the women’s homes prior to the community health campaigns. For women who have not been enumerated, they are enumerated on the spot and then continue onto the cascade of stations. A research assistant conducts an education session on HPV and cervical cancer. groups and are taught about HPV, cervical cancer, screening, and treatment with trained staff members. Undoubtedly, the education sessions take the most amount of time as the educators have to ensure that all the women understand what HPV is, how to screen using the self-collection kits, when they will receive their results and what to expect from the results. In order to ensure that information is not lost in translation, there are standardized prompts that the educators follow from a book which has pictures and infographics large enough for the women to see. They are also taught how to use the self-collection kit at the education station before heading to the pretest table where they collect the self-testing kits and are further counseled about the self-collection screening. One of the most common questions was whether the screening is painful especially after the women saw the brush which resembles a needle when not carefully examined. However, after a swift demonstration and reassurance of the ease of the self-collection kit, women gladly head to the next tent to perform their screening. There, they will find a private sample collection room which was implemented to ensure that women are comfortable and have adequate privacy. 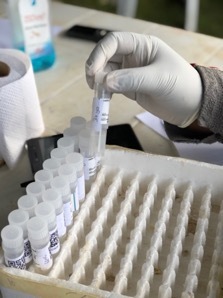 At the post-test station, women provide their kits to a staff member and are counseled about next steps such as when they should expect to receive a notification of their results and whether it should be through SMS, phone call, or a home visit. One glaringly obvious fact throughout the campaign was that many women come in with false notions regarding what can be done at the CHC. It was evident from spending time at the registration table that not all women were aware that they were here for cervical cancer screening even after the mobilization. For instance, one woman came in with the complaint that she had not menstruated since 2000 and yet she wanted to have more children. Therefore, her hope was that this campaign would assist her in being able to bear children again. Others came in search of medication or treatment for fistulas, high blood pressure, arthritis, or HIV/AIDS. However, what was consistent throughout the campaign were the sentiments expressed by the women after they screened. Almost everyone praised the ease of the screening and the opportunity to screen for free. Additionally, when I spoke to some of the CHVs, they stated that ironically, one of the drawbacks of having the CHCs in villages close to the women is that it is difficult to capture the women who leave their villages to go to the town center to sell their goods during the day. This results in unintentionally missing a significant portion of the target population. As one of the first few to screen, one woman stayed for most of the day during one day of the campaign. Instead of going out into the town to sell bananas, she instead sold them to other women who showed up at the CHC as well as the staff. At the end of the day, she was able to earn money and get screened which when asked, was a successful day for her. I wondered, what would be the impact of having a CHC linked to a marketplace so that women are able to earn a living for the day as well as get screened without having to choose between the two? I will discuss such possibilities and opportunities to integrate screening with services from local women’s social and finance organizations in a future blog.